Bar-b-que Pork (shredded North Carolina style) and some good company at Uncle Rudy’s place. 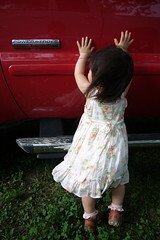 Phoebe desparately trying to get inside a big red SUV, and playing near the pond, getting her new dress really messy! 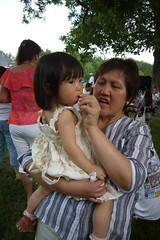 See more photographs in our North Carolina album.